Middleton is one of those fairly sizeable, self-contained villages with its own pub and school, that you still occasionally find in the east of Suffolk. It would be quite possible to live here, using the the shops at Westleton and occasionally going into Leiston for a night out, without ever worrying about what the wider world was up to. 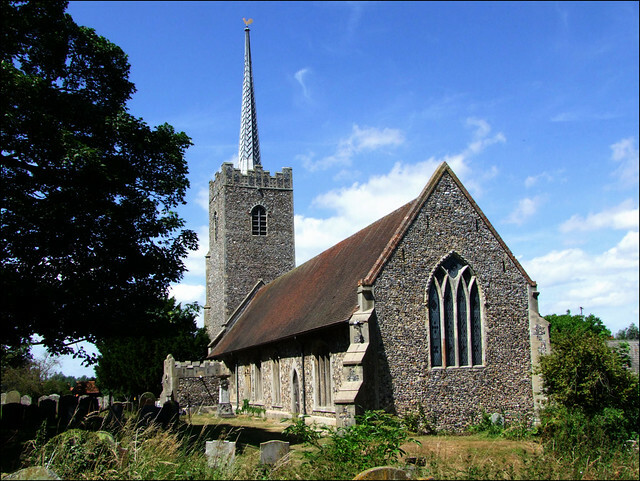 Dunwich Heath and the Minsmere bird reserve lie to the east, and the Leiston to Blythburgh road bypasses the village, so unless you are a making an expedition to the church or the lovely Bell pub on the other side of the village green, you will probably not know Holy Trinity. A surprise, then, because this is a dramatic building with its bold tower and tall lead spire rising above the cottages and treetops. By 1955, the spire of Holy Trinity had become quite unsafe, and was completely rebuilt. One summer morning, as two workmen were putting the finishing touches to the lead around the base of the spire, they looked down to see smoke rising from the thatched roof of the nave below. By three o'clock that afternoon, the church was completely ablaze. There are few signs today to show that this great conflagration happened. Half a century has been long enough to soften the new roofline, which is now tiled rather than thatched. At the entrance to the little south porch is a delightful little drainage plate, obviously the work of some 19th Century blacksmith - if you look closely, you can see how all the bars have been rivetted and hammered into place. The renewed door is set within a Norman doorway, and you step into a church which still retains a rustic feel, despite the discernible patina of Festival-of-Britain crispness common to 1950s and 1960s church restorations. Surprisingly, much of the furnishings are older, because the alarm was raised in time for them to be rescued, but dramatic photographs of that day are on display in the nave, one of which you can see at the end of this piece. The villagers gather around to watch, and smoke and flames billow from the walls and windows. The church had some ancient treasures, all of which survived the conflagration, more or less. One is a massive St Christopher wall painting, first uncovered in 1908; it was damaged by the smoke and water, but has now been restored. The three figure brasses, two medieval and one early-modern, were set in the floor, so they did not melt, but a burning beam fell and smashed the head off of the 1610 brass to Sir Anthony Pettow. This head was lost, presumed destroyed. However, in 1990 the owners of the Old Rectory were gardening in the area where the cartloads of burnt thatch had been dumped thirty-five years before. They found the remains of the head. It has now been reunited with its body, which is in such a delicate state that it has been reset on a wall, so I fear it would not survive another fire. The other survival is the 15th century font. It is worth pointing out that fires in thatched-roof churches tend to do less damage to stonework than those in more substantially-roofed buildings, because the heat is so easily able to go upwards. The font here is so similar to that at nearby Darsham, with a dedicatory inscription in a similar form, that they must surely both be from the same workshop. The inscription asks Christ to grant us spede. The chancel steps are a post-fire construction, set at an angle in a jaunty manner. Perhaps we would not be so bold as to do this now. Up in the chancel, there is an ancient stone coffin lid, and some other stone carvings that are believed to come from the lost church of Holy Trinity, Fordley, which once shared the churchyard. This was not so uncommon before the Reformation; but when the Protestants put an end to private devotional worship and required the seemly, and lengthy, congregational preaching of the Word, the two parishes were gathered together here, and Fordley church was abandoned. These traces are all that remain.